Entire month of December was full of Yoga and spiritual activities at the ashram. Also the devotees from all over including USA, UK, Taiwan and Canada visited the ashram. They felt peace and joy in holy satsang & darshan of Pujya Swami Adhyatmanandaji Maharaj. 16th Yoga Teacher Training Course commenced on Dec10th evening and concluded on Dec 30th midday. Twenty three participants from UK, USA, Canada and India joined the course. In addition to Yogasan, Pranayam, Kriyas, Mudras, Bandhas and Meditation, Anatomy, Physiology, Education Psychology, Management Behavior, Planning, Patanjali Yoga Darshan, comparative study of Yoga was taught by eminent experts during the YTTC. Examination was taken and certificates were awarded by H. E. the Governor of Gujarat, Pandit Sri Nawal Kishore Sharmaji at Raj Bhavan, Gandhinagar. In his valedictory speech, he praised the services rendered to humanity through Sivananda Ashram under the leadership of Pujya Swami Adhyatmanandaji Maharaj. Here to quote his words, "You all are fortunate to learn the science of Yoga from Sri Swami Adhyatmanandaji Maharaj, a worthy disciple Most Worshipful H.H. Sri Swami Sivanandaji Maharaj. These great Gurus are the very treasure of Mother India to protect our community and the world community too. I know Sri Swami Adhyatmanandaji personally; he has dedicated his life for the betterment of mankind and for the upliftment of society. I have been to Sivananda Ashram a number of times and I feel and experience great peace and tranquility. I am a great admirer of Swamiji. It is not flattering; I am really a great admirer of him and feel happy for all his wonderful activities." 725th Yogasana Camp (Dec 22, 2008 –Dec 31, 2008): 725th Yogasana camp was organized at the Ashram premises. 730 candidates joined the camp. Mrs. Ravi Jayanti IAS, Commissioner for Higher Education inaugurated the camp. Swamiji's book "Yog, a j Jivan" (Gujarati) and its English translation “Yoga, a Way of Life", published by Gujarat Times Publication and Gurjar Granth Ranta Karyalaya were released by Dr. Tejas Patel, Dr. Mayur Patel, Dr. Swetang Pancholi, Dr.Anish Kshatriya and Ina Patel. This book is a compilation of articles (of last two years) published by Gujrat Times weekly news paper from New York and Canada. On Dec 28, 2008 in the morning a blood donation camp was organized at the Ashram. In the evening grand Garba and potluck dinner was enjoyed by all. Christmas Eve celebration (Dec 24, 2008): Christmas Eve was celebrated at the ashram in all serenity on Dec 24, 2008 night with Christmas carols and hymns from holy Bible. 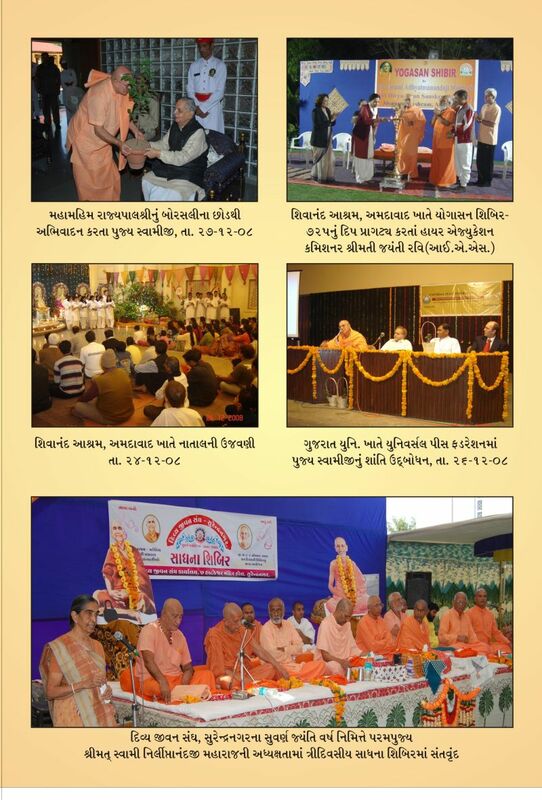 On Dec 6, 2008 Sri Aasthak Samaj of Ahmedabad organized a grand Sri Ayyapan Puja in holy Sri Ashta Lakshmi Bhavan of the Sivananda Ashram, Ahmedabad. Holy Sri Ayyapan worship is famous in South India. It is a disciplined worship. Here one has to live with all kinds of discipline - physical, mental, food, personal habits etc. and also must follow strict rituals. The atmosphere in the ashram was agog with traditional South Indian music of Vedic hymns from Krishna Yajurved from early morning till late night. On Dec 18, 2008 Rev Sri Swamiji Maharaj inaugurated the holy Sri Bhagavat Katha Jnan Yajna at Sri Rani Sati Mandir of Marwadi Samaj. Dec 22, 2008 Sri Swamiji addressed a meeting organized by Universal Peace Foundation of India. 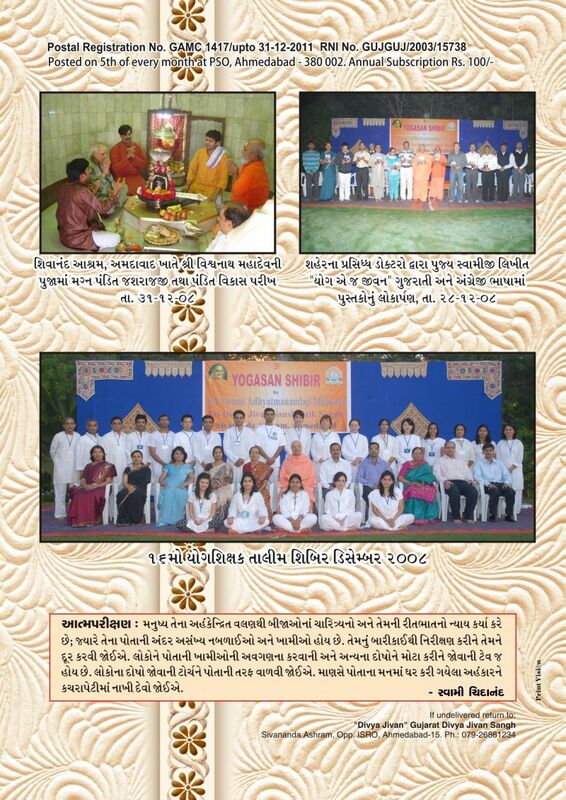 On Dec 10, 2008 Sri Swami Adhyatmanandaji Maharaj was invited for 30th anniversary of Archan Institute of Indian classical dance at the famous Tagore Hall of Ahmedabad. On Dec 27 at noon Sri Swamiji addressed a large gathering of Gujarat University Students and Professors community on the subject of "Efficient Leadership". Honoring sincere request of Yoga and Sports management of Keelung, Taiwan and from Director General of China Yoga Association Taipei, Sri Swami Adhyatmanandaji Maharaj, Yoga Teacher Ratna Kumari, Sangeeta Thawani and Yogi Ankur traveled to the length and breadth of Taiwan from Nov 28, 2008 to December 10, 2008. A three-day workshop was conducted for senior Yoga teachers at Keelung. These three days were filled with discussion and practical lessons on all aspects of yoga including Hatha Yoga, Karma Yoga, Bhakti Yoga, Raj Yoga, Dhyan Yoga, and Satsang. Certificates were awarded to one and all participants. Rev. 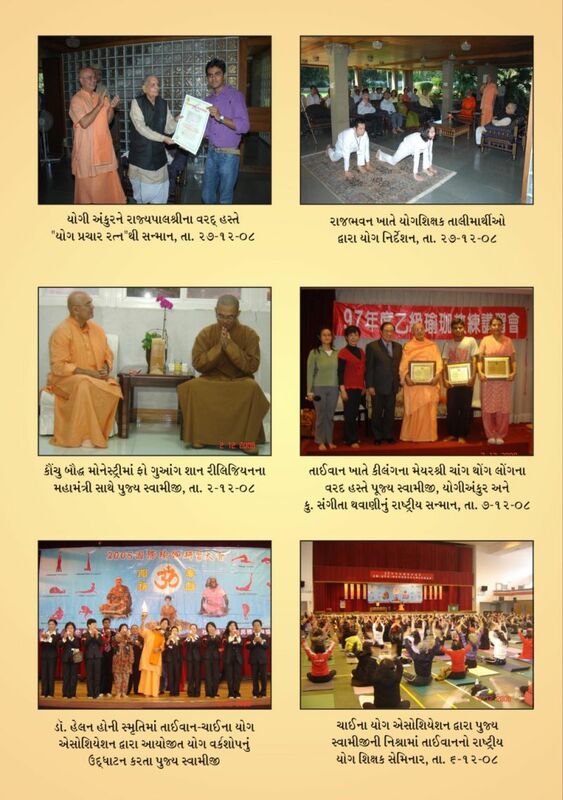 Sri Swamiji Maharaj, Ms. Sangeeta and Yogi Ankur were honored by Mayor Mr. Chang Thong Leunge. A one-day workshop was organized at Taipei by China Yoga Association in memory of Yogini Dr. Helen Hown. Director General of China Yoga Association thanked Sri Swamiji and his team for their services to Taiwain's Yoga lovers. Sri Swamiji visited Kounchou and inaugurated new studio of Yogi Woo. Mr. Jafri Woo, Director of Indo-Taiwan Association, organized discourse of Sri Swamiji and visit to many Yoga studios. Sri Swamiji visited the head quarters of Fo Guang Shan Religion. Here the Secretary General welcomes Sri Swamiji Maharaj and they both had very healthy dialogue between them on global peace and harmony. Sri Swamiji visited a number of organizations including famous True Yoga Studio.On return back to India on Dec10th via Singapore.The entire Tour to Taiwan was organized by Sri Yogi James Lio. Sivananda Ashram, Ahmedabad is highly thankful to him.